Ht = 155, rim L = 305, W = 156, th = 3 mm; handle L = 73, W = 19.3, th = 5 mm; green cylindrical bead L =3.5, diam = 4.3; ring beads th = 1, diam = 1.8 mm [RTS 25/3/2005]. Purchased at Loryok for £1 sometime between 20th and 25th March 1979 by Jill Goudie, an archaeologist who was part of the British Institute in Eastern Africa's Expedition to the Southern Sudan, headed by Patti Langton [RTS 18/8/2005]. Gourd food bowl consisting of a narrow flat-topped rim with slight use wear, on a convex sided body with a convex base; the rim is constricted down the centre of one side and swollen on the opposite edge, representing the base and neck areas of the original plant, and producing a vessel with an irregularly oval plan view. This was made by bisecting a gourd, scooping out the pulpy interior, drying the shell and removing the lighter coloured outer skin. A handle has been added just below the rim at the centre of one of the long sides, made from twisted grayish brown sisal fibre cord (Pantone warm gray 10C), plaited into a broad band, 4 rows wide, and stitched through holes at either end of the handle onto the gourd wall. On one end, the cord is passed back to the exterior and then wound several times around the base of the handle, with a single cylindrical green glass bead strung onto its knotted tip (Pantone 345C). The interior of the bowl is a grayish yellow colour (Pantone 7507C), discoloured through use; the lower part of the body has been stained a more reddish colour from some former contents. The exterior is a strong reddish orange colour (Pantone 7517C). This has been decorated with a series of incised and black charcoal inlaid patterns. These consist of a broad band that runs around the circumference just below the rim, framed by horizontal lines and filled with a row of crosshatched triangles pointing up and down from the base and top lines respectively; these create a row of lozenge-shaped spaces between each pair of triangles. There is a single line beneath this, then a second broad band of similar design. These bands are interrupted at the centre of either long side, where the base of the lower band is extended upwards to form a vertical frame, with a single parallel line running beside it and along the base on one side, and double parallel lines on the other. The latter group was partially filled in with crosshatching. The execution of the decoration is irregular, with many lines overlapping their frames. There is an additional mark running around the circumference below the rim, and halfway down the upper band; this is a lighter colour than the gourd surface in place and a darker smudge elsewhere, and it is not clear what has caused it; it has not been incised. The bowl is compete, but has cracked at the rim and been given a local repair. This runs vertically down the upper body from the rim, and consists of 10 tiny pairs of holes bored on either side of the crack, and threaded through with a fine cord; this looks greasy, and could be either grease coated fibre or sinew. Some of the thread has since pulled away. On the outside face of this mend, a series of 12 small glass ring beads have been threaded, to run in 2 vertical rows down the seam; these consist of 3 light blue (Pantone 2975C), 5 red (Pantone 200C), 3 green (Pantone 346C) and 2 black beads (Pantone black 6C), not in that order; on the left side of the join blue or green beads seem to alternate with red or black; on the right side, red or black and blue beads alternate. At least one bead appears to be missing from the sequence on each side. There is also some cracking on the interior base, and possible insect bore holes. There are also patches of wear on the bottom of the bowl exterior. It has a weight of 208.8 grams, and is 155 mm high, 305 mm long and 156 mm wide; the rim is 3 mm thick, and the handle is 73 mm long, 19.3 mm wide and 5 mm thick; the green cylindrical bead is 3.5 mm long and has a diameter of 4.3 mm, while the small ring beads have a diameter of 1.8 mm and are 1 mm thick. Purchased at Loryok for £1 sometime between 20th and 25th March 1979 by Jill Goudie, an archaeologist who was part of the British Institute in Eastern Africa's Expedition to the Southern Sudan, headed by Patti Langton. This gourd was used for eating from; its local name has not been recorded. The incised decoration on vessels like this seem to have been applied using the same technique as recorded for the northern Larim. There women use a needle to incise the pattern into the surface, then rub charcoal over the lines to colour them. This technique differs from that used by the Dinka, who mark out their designs in charcoal, cut them into the surface with an iron needle then burn them in using a heated spear or knife blade (for an example of this method, see 1979.20.91). 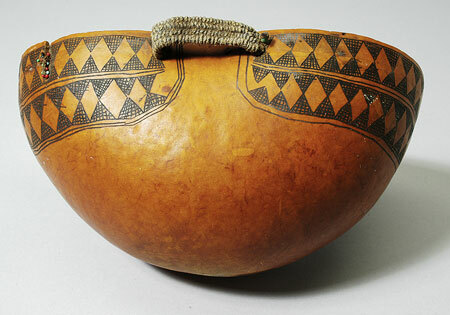 This particular vessel has a similar decorative design to that used on gourd bowls 1979.20.163-4 and 1979.20.168. Accession Book Entry - [p. 185] 1979.20 (.1 - 206) P[urchase] MISS PATTI LANGTON, DEPT. of ETHNOLOGY & PREHISTORY, OXFORD. Collection made by Patti Langton during the British Institute in East Africa's expedition to the Southern Sudan; Jan. - April 1979. The collection was made in three culture areas during the dry season. The amount paid for each object is listed if the information is known. In Jan. 1979 £1 is equivalent to 95 piastres (pt.) Sudanese. This documentation is based largely upon Patti's own list of objects and her notes on these. Sometimes objects included in the Pitt Rivers alootment of the collection do not appear on her list and have been added here. See Related Documents file as well. [p. 204] 1979.20.136 - 193 SOUTHERN SUDAN the LARIM The Larim live about 50 miles west of Kapoeta in the eastern corner of S. Sudan. They are a non-Nilotic pastoral people, living in permanent mountain villages. They are part of the Didinga-Longarim-Murle language group. They live in the Boya Hills - Boya is the Topasa (neighbouring group) name for the Larim, which is also used by the Administration. Longarim is the Didinga's name for them but they call themselves the Larim, and that is used here. [p. 205] The LARIM The collection was made in two parts. The "PL" labelled material was collected during Pat Langton's stay in a village in the Northern Larim area. The "∆" labelled material was collected by Jill Goudie, one of the archaeologists on the Expedition, from the base camp LARYOK, among the Southern Larim. Money is known among the Larim but it is used only for buying beads for women from Kapoeta, or for the few members of the group who would go to Juba. The women especially were more interested in exchange gifts of salt, cloth & soap. The Larim material is documented in three parts: a) General Larim pieces - no information as to which section of the Larim it comes from b) the "PL" Collection from the Northern Larim, from three of the eight Northern Larim clans c) the Southern Larim material collected by Jill Goudie, numbered "∆". [p. 210] 1979.20.163 - 193 SOUTHERN LARIM: Collected by Jill Goudie between 20.3 and 25.3.79  1979.20.167 Gourd for eating, similar to 1979.20.140. This has a sigal [sic - appears as sisal in RDF, which = a plant fibre, RTS 26/5/2004] handle and has been repaired. L = 30.5 cm. ∆8. £1. Additional Accession Book Entry [below accession number in red biro] - A5-F35-4. Card Catalogue Entry - There is no further information on the tribes catalogue card [RTS 26/5/2004]. Related Documents File - 1979.20 contains a typed packing list, which has been annotated; a typed list of objects arranged by Langton collection numbers and with pencil and biro annotations, and a handwritten list of objects by museum number, essentially repeating this information and annotated with PRM photo numbers in red. This handwritten list seems to be the direct source for the accession book entry. This item appears in Langton's list under the heading 'Southern Larim. These were all collected between 20.3.79 and 25.3.79', with entry 'Gourd to eat from, as PL 2. This has been repaired, with a handle (sisal) [RTS 12/1/2004]. Pitt Rivers Museum label - AFRICA, Sudan, Loryok. Southern Larim. Gourd bowl with handle and beads, for eating from. Repaired. Coll. P. Langton, no. 8 [in triangle]. 1979.20.167 [plastic coated label, tied to object; RTS 23/3/2005]. Written on object - 8 [in triangle, pencil], S. SUDAN S. LARIM, P. Langton Coll. 8 [in triangle], ,1979.20.167 [ink; RTS 23/3/2005]. Sparks, Rachael. "Southern Larim bowl" Southern Sudan Project (in development). 03 Jan. 2006. Pitt Rivers Museum. <http://southernsudan.prm.ox.ac.uk/details/1979.20.167/>.